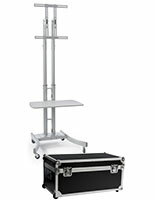 Fits Monitors 32”-65”, Up to 110lbs. 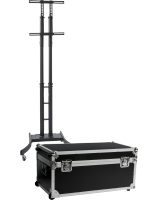 The portable TV rack features a 19” pivoting AV shelf for electronics and includes a travel case for the LCD mount that is lined in EVA foam padding for extra protection with (2) rolling wheels, (2) recessed handles, and (1) luggage handle! (Please note that the shelf does not fit into the portable crate with the TV stand). 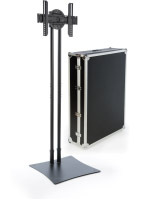 A state-of-the-art folding base design effortlessly fits into the carry bag so assembly and disassembly is quick and easy for an on-the-go company selling products and services at trade shows, exhibits, and other events. 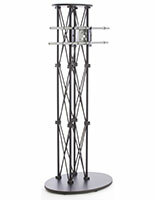 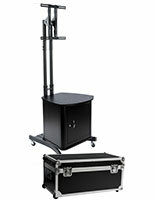 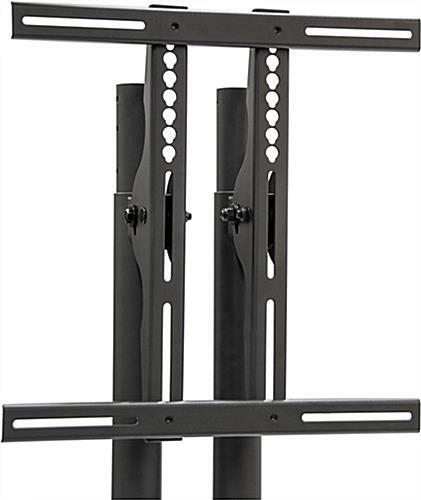 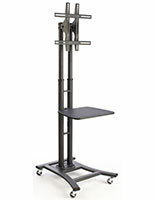 The flat screen bracket of the floor standing TV rack can tilt for various viewing angles and the monitor can be positioned at (5) different heights between 51”and 69”. The 19” wide AV shelf can hold electronics and media for presentations and can be mounted at (3) different spots on the extension pole. 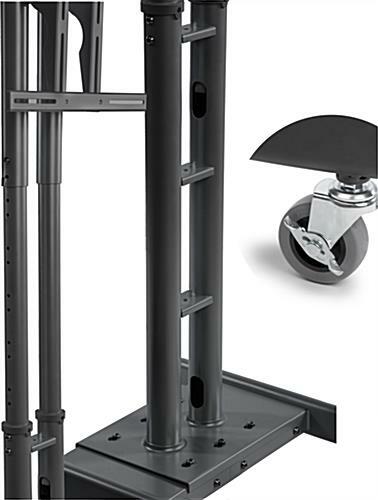 Cable management hides cords inside of the columns to keep wires organized and out of view while presentations take place and (4) locking caster wheels keep the TV rack stationary to prevent unwarranted movement of the monitor. 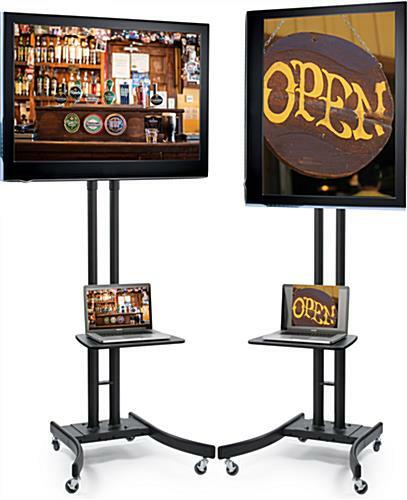 This model is designed for 32”-65” LCD screens that weigh no more than 110lbs and the bracket has a maximum 700x500 VESA capability. 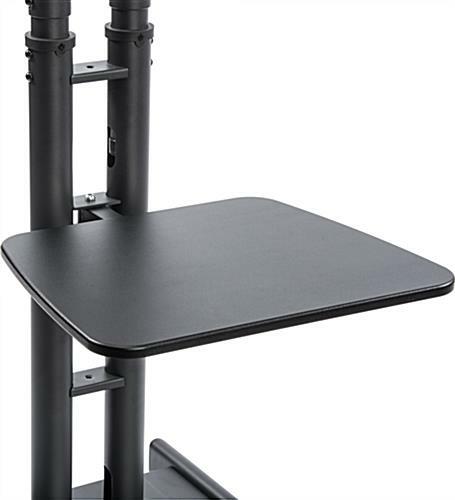 Please Note: The labtop shelf can be fixed to one of these three heights: lowest height of 15.28", middle height of 24.33", and hightest height of 33.39". 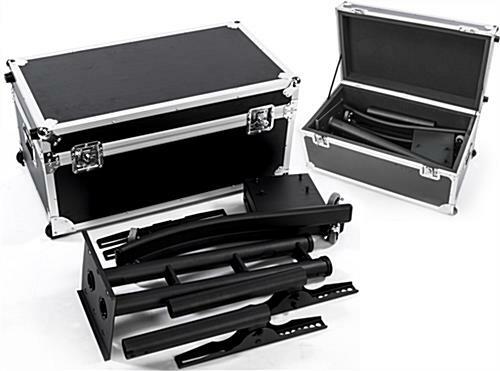 29.0" x 77.0" x 22.0"
29.0" x 6.0" x 32.0"
36.0" x 17.5" x 19.5"
Thanks for the great review, Dany! 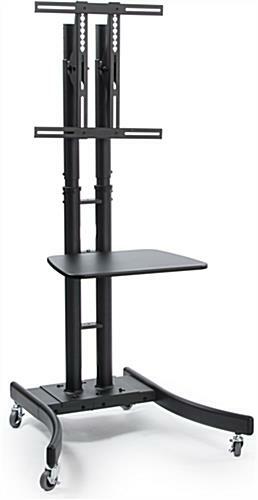 We're glad this TV stand works perfectly for you.